Kaine is by his very nature an optimist. He always looks for solutions to problems, feeling that very few difficulties have no solution, he very much does not believe in a no-win scenario. 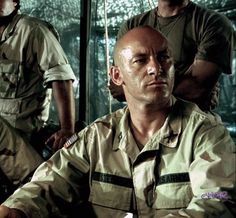 He is belligerent, even aggressive, especially when defending his family or his people, though he is kind, gentle, and accommodating to his loved ones and his allies. Kaine is a warrior, and a lifelong military man. He is organized and professional when it comes to work, and horribly unprofessional and disorganized when off-duty, usually involving a bottle. He would say that he works hard and plays hard. He genuinely wants the best for Mandalore, and for the Galaxy, and would prefer to see things peaceful and prosperous. He is not an idiot, however, and realises this is a pipe dream, but doesn't let that stop him at least making an effort to try and improve everyone's lot in life. Skilled with a wide variety of both melee and ranged weaponry. clan and immediate family members..
Kaine's face is weathered, generally sporting stubble. His eyes, however have not dimmed with age and exertion, still retaining the brightness of youth. Several scars tell the tale of battles long past. An imposing figure even without his customary black and green beskar'gam, Kaine stands head and shoulders above most average humans. The armor he wears pretty much constantly only adds to his bulk and intimidation factor, from behind the ubiquitous Mandalorian T-shaped visor. Festooned with an array of weaponry and technical gadgets, Kaine's beskar'gam turns the experienced warrior into a one man armed, armoured fighting machine, capable of engaging multiple targets simultaneously, and coordinating a variety of battlefield units, all from the comfort of his buy'ce, which is lined with communications and electronic tech, most of which can be controlled by blink and speech commands. Fathered by a Sith Lord on a Mandalorian smuggler, Kaine was raised by his mother on her freighter. Together they travelled to Manda'yaim for Kaine to go through his trial and coming-of-age. Kaine travelled to Dxun and killed a Zakkeg as part of his verd'goten. Upon leaving Mandalore at age 13, Kaine served in the Borleias Military, reaching the rank of Colonel. Many of Kaine's small unit tactics are still required teaching at the Borleian Military Academy. Kaine fought in the Yuuzhan Vong war. Kaine trained with his father, Darth Vesull, for a time, before abandoning his teachings to join the Mandalorians. He met his father for a final time on Korriban and though he defeated him, fell victim to essence transfer. Vesull was later captured, imprisoned, and tortured on Belsavis, allowing Kaine to regain control. Kaine returned to known space, finding his family, Clan, and vode slaughtered. After the hyperspace accident that propelled the transport he was on some 800 years into the future, Kaine and what was left of his Clan began the long, arduous task of adjusting to the new way of things, and rebuilding their shattered Aliit. Pooling their resources, all that came with them was of value, and went towards reconstruction. Soon enough, the more mercenary types had established sources of income, and the Clan founded MandalArms, producing weapons and technology to Mandalorian tastes, funding the growth of the Clan. The Mandalorian Alor that led the growing young Clan made many new associations in the first few months and years, including his wife Caz, and many of those who would rise to leadership roles within Clan Australis in the coming years, including Strabo, Auriana, and the Nebus sisters of Kiffu. Upon making contact with the Mandalorians, Kaine met with several on Commenor, also coming to meet the ruler of that world; Lady Kay Arenais, for the first time, a meeting he waswoefully unprepared for, but would have repercussions later on. This led to an invitation to Manda'yaim, which he had heard had been recently devastated. It was a solemn homecoming indeed, not only for what had happened, but for what had yet to pass. Kaine Australis came to Mandalore on the very day of the Red Coronation. An auspicious day, filled with fire and blood, a day that changed him, and Manda'yaim itself, forever. The Australis Alor had watched from the crowd, as the Dark Lord of the Sith knelt to a female warrior. The Mandalorians were at boiling point, and soon enough, the throne room had erupted into a short, vicious fight. During the battle, Kaine briefly engaged with the notorious bounty hunter Koda Fett before the events of the day took them apart. The schism among the Mandalorians brought Kaine Australis into the fold of Yasha Cadera, then Yasha of Clan Mantis; Mand'alor the Infernal. Several discussions took place in the uncertain weeks and months following the Red Coronation, and Kaine was a loud voice at every opportunity, pushing for reconstruction, a strong, united Mandalorian people, and putting his Clan forward to fight and build for their people. Following the events of that hellish conflagration, and the political turmoil that followed, the Mandalor propelled General Kaine Australis into a leadership role within the Mandalorian Empire. Though there were few diplomatic successes, the expansion of the Empire's territory saw victories at Myrkr, Ploo and Concord Dawn in the early months. Clan Australis, by this time, had set up home on the planet Myrkr, and grown exponentially since its arrival, to become one of the largest Mandalorian clans in the Empire. Military strength was a large part of the Clan's contribution, with trained fighters, weapons, vehicles and vessels being produced daily for the ever growing Mandalorian arsenal. Family too, only grew with time. Kaine was reunited with his brother, Abel, and his daughter, Beth. In time, Caz and Kaine adopted five war orphans rescued from Slavers on Ploo; Elenn, Bronte, Garath, Lov, and Lam. All the children resided with Kaine and Caz on Myrkr, and were present during the time the world was attacked. Following the successful defence of the Clan's home, Kaine redoubled efforts to fortify the world against future attack, and led efforts to expand the Mandalorian fleets, to prevent future incursions. This directly led to Project Spymaster, among other endeavours. The growing Australis family also shared its grief, most notably the loss of Raiz and his son Dmitri, a grief that consumed Cassiopeia; Raiz's wife, and left Kaine to take charge of his granddaughter, Lily-Grace, and raise her as best he could among the other children. What was to come, however, changed things forever, and left their mark on the following years. A pregnant Yasha was kidnapped by pirates, leading to a series of border skirmishes between the Mandalorians and the Silver Jedi Order, led by Kaine, much souring relations with the SJO. Yasha was rescued, but only after great time and exertion, and her child was in dire straits. With the other vode giving comfort to and restraining the distressed mother, it fell to her General to stand vigil over the medics and the dying infant. The medics failed. The General broke. In his grief and madness, he made a deal with the devil. Kaine's father, a Dark Lord of the Sith, had waited for his son to break, and took his moment, offering to save the child. Kaine broke, and accepted the bargain; freedom for a life. Though he retains no memory of what happened next, only two beings left that medical complex alive, Kaine Australis, and the baby Adara. Kaine managed to put the infant into her mother's arms before being arrested. 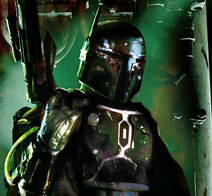 Charged with violation of Mandalorian decree, the penalty was commuted to being stripped of rank and imprisoned. Kaine suffered his captivity with much relief, treating it as a holiday, though he hadn't bargained on the other part of the penalty; he was to take the Cure, a concoction that removed the Force. As with the rest of his sentence, Kaine accepted it, and his father's hold on him was broken along with his connection to the Force. During his imprisonment, the young Mand'alor brought the baby girl Adara to see Kaine often, and the two formed a strong bond, which was to prove stronger still when Adara's father, Kaden, was killed, and Kaine agreed to adopt and raise the girl as his own. that would end his career. Victories for the Mandalorians at Sullust, Hapes, Vena, Taris and Colla, as well as a daring raid on Kashyyyk itself brought prestige to the Empire, as well as credits. The Warmaster served as part of the Outer Rim defence of Skor II, as well as the defence of Mandalore itself during a raid by rogue Imperial elements, similar to those that had raided Myrkr years before. Military successes were tempered, however by the loss at Umbara where a Mandalorian blockade had been countered quickly by overwhelming force, reducing the effort to an abortive raid. Mand'alor who, after the Golden Festival of life, on Manda'yaim restored, had become his lover. In secret, he concieved Project Tantiss, after which he was restored to the Force, among other things. By now Kaine was wise to the threat the Dark Lord presented to his family and his children, and he was willing to take extraordinary means to achieve success.Once the Project was complete, Kaine made a full accounting of most of it to the Mando'ade. Needless to say the personal adjustments were kept quiet, but the troops and the leaders produced from Mount Tantiss would make their own mark on the Mandalorians' struggles to come. Kaine though, had a new quest to embark on, one unlike any he had undertaken before.To save Yasha's life, and Adara's, he would go to Sabarene, and seek instruction. That time was unlike anything the old mando had ever experienced, being exposed to a view of the living Force he had never considered, which opened so many doors to him he had thought long closed, while giving sense to words spoken, so long ago, when he had been unable or unwilling to listen. Armed with this new knowledge, Kaine went to Ithor, and with the aid of their priests, healed Yasha for all time, and discovered how to heal Adara too. The galaxy has a way of balancing the scales, however, and with things going so well, trouble was just around the corner. The Sith Empire had invaded and occupied Commenor, and with Yasha away, Kaine was in command. Blatantly misusing his rank, Kaine ordered a significant portion of the Mandalorian fleet, including one of only two Super Star Destroyers to Commenor, to lift the siege. This proved unnecessary with Sith forces having pulled out, and had left the Empire exposed. Accountable to the Mand'alor when she returned, Kaine was given the choice to resign or be court martialed. Secure in the knowledge that Yasha would not lead the Mandalorians into bed with the Sith, Kaine resigned, and took Clan Australis out of the Mandalorian Empire. Following the independence of Clan Australis, assisted by the financial backing of MandalArms, by now one of the primary arms manufacturers in Mandalorian space, exporting across the galaxy, began to make inroads into unclaimed space closer to the Core. Kaine set up Kanjiklub in the Bilbringi system, as a way to bring mercenary forces togeter for mutual gain. In addition, he formed the Foreign Legion, a paid, professional military outfit, designed to secure fighting beings from among those unsuitable or unwilling to become Mando'ade. Though they had left the umbrella of Mandalore, the Clan's strength and numbers remained relatively intact. Even with the SJO resentment still strong from Kaine's actions against them, the goodwill generated by his actions at Skor II and Commenor, taking a stand against both the First Order and then the Sith, despite strong opposition from among his fellow Mandalorians, has allowed the Clan to make contracts with the New Republic, and Commenor, augmenting their military actions, and setting up bases and infrastructure closer to the Galactic Core. Following the Battle of Corellia, Kaine was commissioned to the rank of General in the Republic Navy, taking a position within Starfighter Command. This allowed him to retain fleet commands while remaining at the rank of General, one he far preferred to that of Admiral, though he commanded ships, he was at heart a soldier. His injuries from Corellia, though grevious, healed over time, as Clan Australis made closer ties to the burgeoning New Republic, establishing new holdings closer to the galactic Core, including Alsakan and Borleias; the latter world a hostile place where the Clan had made its second home. There were no shortage of battles, with skirmishes over Rendili and battles elsewhere in the Core, as pirates, Sith, and other miscreants strove to impede the growth of the Republic. Kaine fought hard, and well, seeing the Republic's armed forces grow in confidence with every victory. Things took a turn with Kaine's participation, as a light side apprentice, in a Jedi raid on the Sith-held world of Ossus. The raid had been intended to recover some sacred texts, but as fate would have it, Kaine's first Jedi mission nearly became his last, as he entered the library and came face to face with the Sith Emperor himself. Only the timely intervention of his Master; Manu Xextos, saved the old Mando from the grave, and though he survived the Dark Lord, the battle cost him a sword hand, in combat with Taeli Raaf. The Jedi escaped Ossus with their lives, and Kaine went immediately to Wayland, where he could be healed of his injuries, and a new cloned hand as good as the old one created and implanted to replace the lost limb. No sense letting the children see his maiming, let alone Caz and the pregnant Yasha. Healed and much chastised from his encounter, Kaine returned home and spent time with family. He also took up the study of Soresu form as his master had insisted for some time, having had the lesson brought home that he still had much to learn. And following the Battle of Csilla, in which Clan Australis forces fighting on behalf of Kanjiklub for the Jenari Empire against the Sith-Imperial war machine won a series of minor victories, Clan Australis returned to Mandalorian space with their Alor, his exile, ended, home among his people and his family and friends once again. Met, wooed and won his wife Caz Australis. Founded MandalArms, and a Clan Australis base on Myrkr. ME Dominion of Nyriaan - Gladiators! Edited by Kaine Australis, 13 April 2019 - 06:57 AM. Edited by Kaine Australis, 02 December 2018 - 04:36 AM. Edited by Kaine Australis, 13 April 2019 - 06:15 AM.